Since the abdication of King Adria and the closing of el bulli, the Scandinavians have taken up the mantle as the world’s most adventurous chefs. In fact it is a Danish restaurant, Noma, which is now considered the best restaurant in the world. And one of the founding chefs of Noma, Mads Refslund, is now cooking at Acme here in NYC. Refslund is quick to point out that he has nothing to do with Noma, and has not for some time. Instead he took over the space of Acme, a dive-y Cajun restaurant on Great Jones Street. They may not be doing the “world’s greatest” cooking at Acme, but the food is incredibly inventive and fun. I know this because when my parents and my sister were in town over the holidays, we met up for a meal there. Normally we go to a nice restaurant, usually Italian — we’ve done Felidia and Babbo — but this time I wanted to push the envelope a little further. Most of the dishes are meant for sharing, at least according to the menu, so we ordered a whole bunch of stuff to share. My mom started with the Seasonal Country Toast (above). 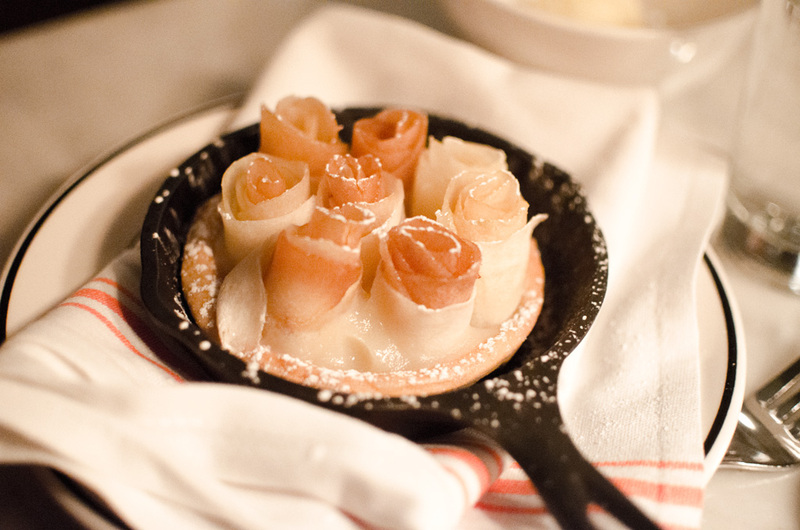 As the name implies, this dish changes with the seasons. 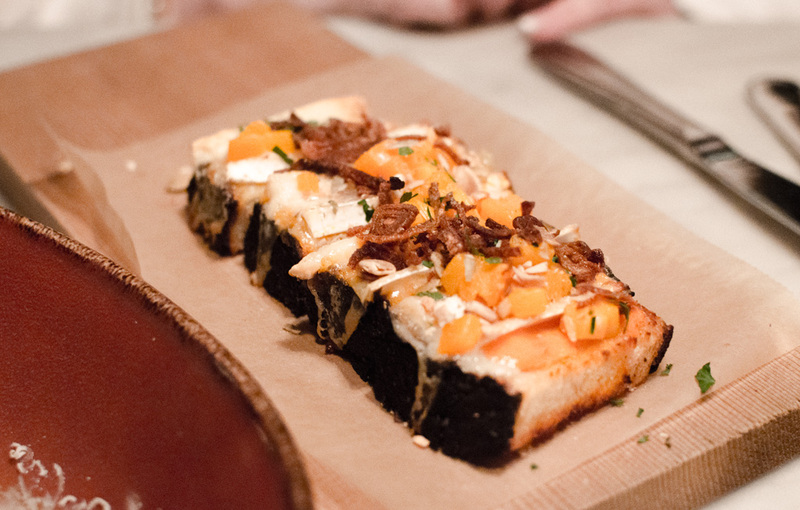 In this case the toast was topped with butternut squash paired with melted brie and fried onions. It was a nice blend of salty and sweet, with lots of creamy textures offset by the crunchiness of the bread. 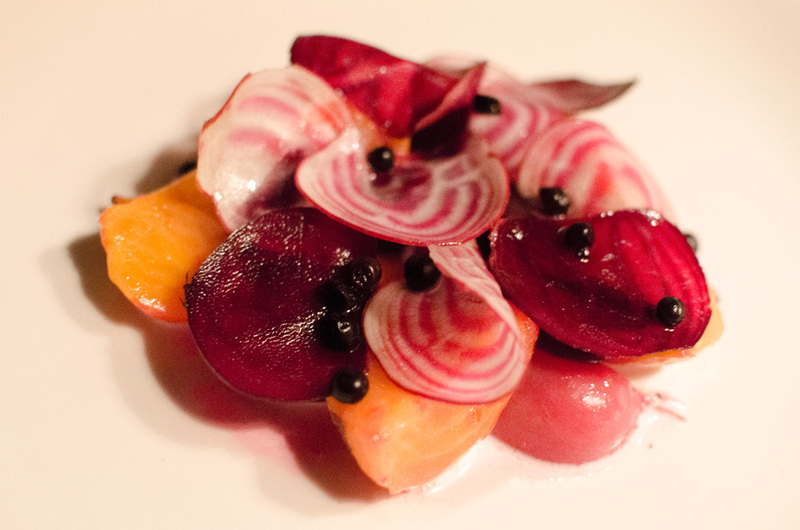 Another seasonally appropriate dish was next: Autumn Beets, paired with pickled huckleberries. There were big chunks of cooked beets, along with thin, crisp slices of raw candy-cane beets. The huckleberries seemed like a nice touch, but they weren’t as acidic as I had expected considering they were pickled. Still, a beautiful and well balanced dish. 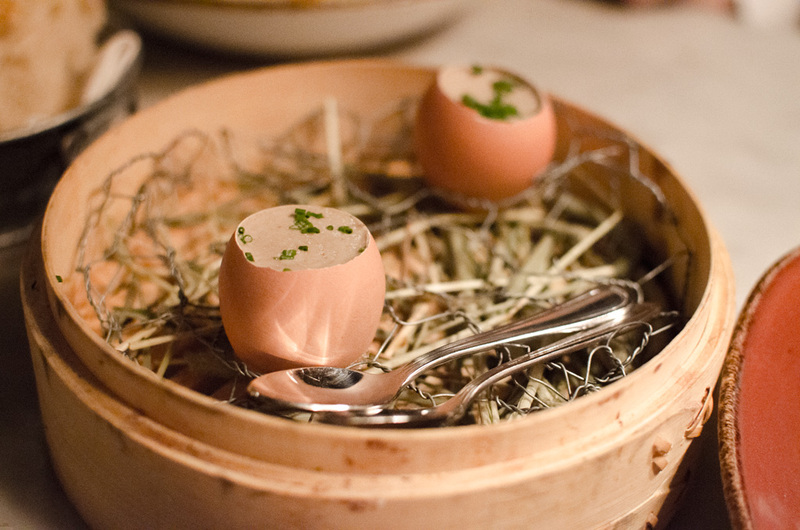 The Farmer’s Eggs won the award for most dramatic presentation of the night. 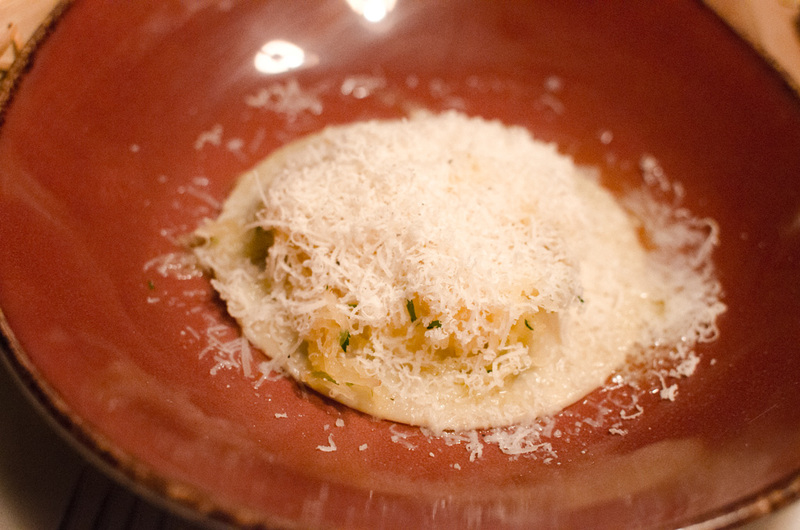 Filled with soft-cooked eggs and an earthy mix of mushrooms and parmesan, they were fun to scoop out of the shells. 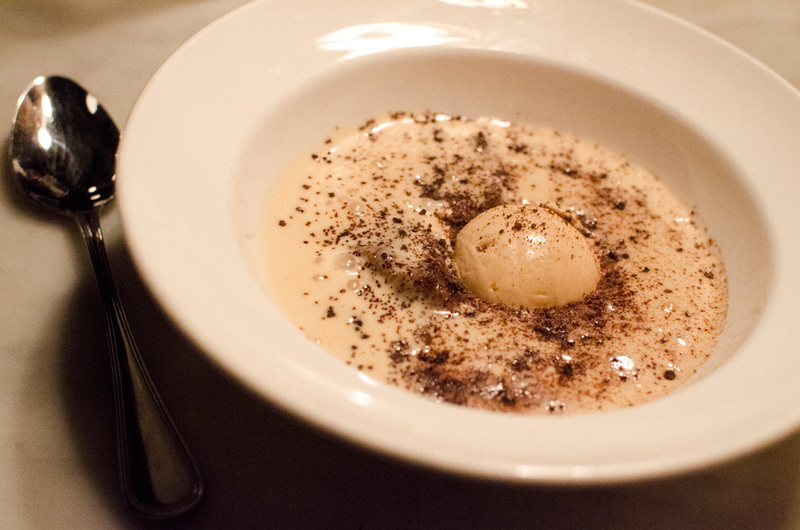 I couldn’t help compare them with the truffle custard I had at Comerç 24 in Barcelona, and Acme’s version (not being a custard and not containing any truffles) could not help but suffer in the comparison. Next up was the Raviolo, filled with a runny duck’s egg and house-made ricotta, then topped with strands of spaghetti squash and parmesan. Although a little colder than I would have expected, the enormous raviolo (the singular of ravioli) was rich and satisfying; the yolk came oozing out when the pasta was broken open, the ricotta was smooth, and the spaghetti squash provided a surprising crunch on top of it all. This is the dish that inspired my post over on Pot-Roasted Cauliflower. Though not quite what I had expected, it was still an interesting dish. 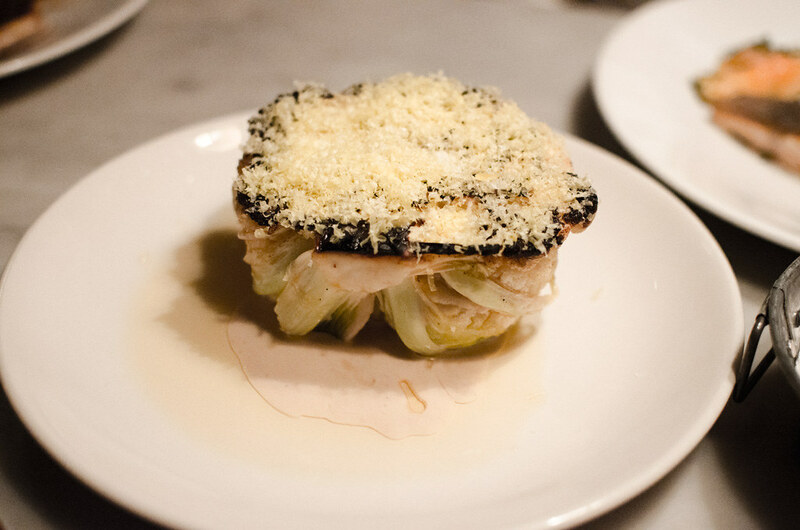 Half of a head of cauliflower was roasted in a pot, then served with a sauce of cured egg yolk. Although I couldn’t discern any of that egg yolk, I enjoyed this relatively straightforward approach to the vegetable. Our final savory course was called simply Whole Grains. 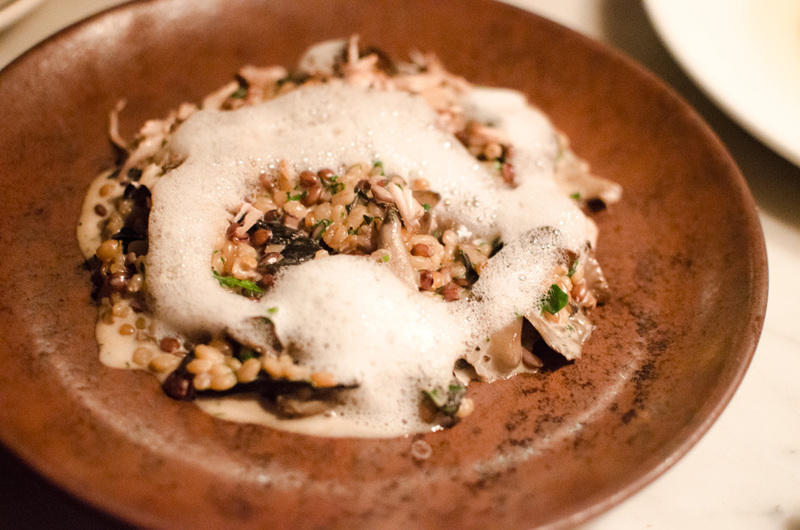 The mix of grains (wheat berries, farro, probably a few others) was topped with a parmesan foam and “foraged mushrooms.” Noma, the restaurant in Denmark, is famous for its use of foraged items, and here was a little taste of that. The dish was earthy and filling, though it could have used a hint of acid to balance the dish out. Of course we had to order desserts. I got the Beer & Bread Porridge, which our server recommended over the intriguing sounding Fallen Fruits. Chunks of rye bread had been soaked in beer, then served in a creamy sauce with a scoop of salted caramel ice cream. I had been expecting a bread pudding-like dish, and this was not that. The beer-soaked bread had a sharp, almost savory flavor, balanced out by the sweetness of the ice cream. It was an interesting dish, a dessert that made me stop and think about my own expectations for dessert. I’m not sure why, but my sister saw the Pear & Parsnip Tart on the menu and decided she had to order it. We were both surprised by how well the parsnip worked in a dessert, but were disappointed with what seemed like unripe pears. The creme fraiche ice cream served along with the tart added much needed sweetness and richness to the dish. So you may have noticed that I thought there were flaws in just about every dish we had — and I haven’t even mentioned how expensive the meal was. And yet I came away with a positive feeling about my meal that night; everything was intriguing, and kept us interested the entire night. Subverting expectations can be dangerous, but at Acme they manage to pull it off.